Our guest post today comes from a terrific friend of the Inkpunks: Matthew Sanborn Smith. The voice behind the terrific Beware the Hairy Mango podcast, and a prolific short story writer, Matthew’s one of the hardest-working folks I know. Today he’ll tell us a little bit about self-publishing and the madness that goes along with it. 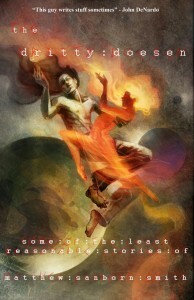 Also, be sure to check his book’s amazing cover art, by our own Galen Dara! Hey, Folks! Matthew Sanborn Smith here. I’ve just released my first self-published short story collection, The Dritty Doesen, and Wendy offered me the chance to talk to you guys about why I decided to do such a thing. If you haven’t done it yourself, you may have considered it. You may have also talked yourself out of it. Let me tell you what went through my head. I have self-published a couple of short stories, so we’ll back up to before that happened. My biggest problem with self-publishing years ago was the legitimacy issue. I started submitting to mags in the early nineties when they didn’t do e-anything with the exception of e-lectricity. Self-publishing was confined to ink and paper and was looked upon with the same respect an animal might give to the bottom of its cage. It was proof the author wasn’t good enough to sell anything to a real publisher. It was an act of desperation. It was tacky. Everyone knew this save for the self-published writers themselves, and maybe a few of them knew it too. Although most people don’t engage in self-publishing, most do engage in self-contradiction. At the same time I was busy knowing all of those things at the end of the preceding paragraph, I was also knowing that Ani DiFranco was one of my heroes. It’s not that I was a super fan. I only knew a couple of her songs. She was a hero to me because she started her own record label at eighteen years old and released her debut album the following year. You can shut the biography right there. I don’t need to read another word; I respect the hell out of her. But self-publishing was for losers. It took years of steady evidence piling up in front of my eyes for me (and a lot of other people) to come around. Sixteen years earlier, Rush did what Ani did before they got picked up by a major label. That Sky Captain guy made a whole feature film on his computer. Youtube people got paying gigs. Scalzi sold a novel after blogging it. Then there were those novel podcasters. I met my doubts halfway and self-published a story that had already sold to a pro market. I did this in part because a publisher was releasing one of my stories as an e-book, and I wanted to have another thing available under my name in case a satisfied reader was looking for another fix. It also felt right because the story I was putting out there myself was no longer available online, as the original publisher was a webzine and only archived authors’ stories for about three months. And so I eased myself into the water. Know, oh prince(ss), that this story made a piddling amount of money as an e-book. Here are three reasons I think that’s so: 1) I am a piss-poor marketer, 2) People that sort of liked me had already read the story when it was free, and 3) I didn’t give it a village in which to thrive. But I didn’t do squat, and let those titles sit there for a few years. I’d like to say that I smartened up on my own, but it was my sister who got me back on track. She’s had great success through Amazon and inspired me with something as base as numbers. I know going into this that I won’t see her kinds of numbers myself. She’s publishing romance novel trilogies and I’m publishing science fiction short stories. There’s a world of difference in demand for those two things. But I’m sitting on a hundred and fifty short stories that, whether I’ve sold them or not, are now hanging out on my hard drive with nothing to do. Even after culling all the bad ones, I have enough for six collections. And collections are important here. I started back in by thinking I was going to publish each story individually. I only got one more story out the door though, because I had another conversation with my sister. Because I misunderstood Amazon’s fine print, I didn’t realize an author could pick up 70% royalties by pricing his or her work between $2.99 and $9.99, as opposed to getting 35% royalties at another price (as of this writing). I’d planned to sell each story at $0.99. (Does anyone else remember that typewriters had a key for the cent sign?) Even I, the biggest fan of my own work, think that charging $2.99 for a single story is a rip-off. By collecting the stories, I feel okay charging more. Also, I think a variety of stories increases the chance the reader will be happy with their purchase. You may wonder if a lot of individual stories at a 35% royalty might net more than a few collections at 70%. Let me know. I write different types of stories, as I’m sure you do, and I initially planned on including a wide mix of stories in each collection. A little something for everyone. Soon I realized how awkward it might feel going from a story centering on a heart-breaking death to a silly piece of absurdism. I couldn’t find an order of contents that wasn’t jarring. It would probably be better to separate the collections by theme. Adventure, silliness, strangeness, so-dark-you-want-to-take-a-shower-afterward, melancholy, and teetering on the edge of comprehensibility. Not everything appeals to everyone. Among those choices, there are those collections a reader might seek out, and some he or she might avoid altogether. One of the reasons I’m self-publishing is that I’m confident that some of my work does not have mass-appeal. It’s weird. It doesn’t always look like what you’d expect from a story. But I’m just as confident that someone will like it. My podcast, Beware the Hairy Mango, has only a very small following. Most people don’t care for it. But the ones who do care for it love the hell out of it. There are people out there, sprinkled amongst the general populace that are dying to read your work. You just have to reach them. In the past, I’ve done my own covers. I’m very risk-averse when it comes to laying out cash. But for the past year or two, I’ve been trying to stretch myself and try some new things. I realized when I reach the end of my life (assuming I know it’s happening), I’ll feel much better about the things that I tried and failed at than the things I never tried at all. For my current collection I decided to take a chance and pay a pro. I went to my Inkpunks friend, Galen Dara, because I knew she’d do something wonderful. She did. You needn’t see the cover as an obstacle. As I said, you can always update an e-book. If you’re on the fence, you can create your own cover now and always change the cover in the future. So let’s boil this down. Why might you want to self-publish? Whatever stigma there might have been in the past is largely non-existent now. You’ve got stories you believe in that aren’t what professional editors are looking for. You’ve got stories that have previously sold, the magazine’s period of exclusivity has expired, and you want more people to read this proven material. You now have the power to release whatever you want, however you want. You don’t have to worry about what’s in vogue. That’s pretty punk. You’ll reach people you never knew existed. And you’ll be someone’s favorite writer. You have nothing to lose. Although I did hire Galen to create the cover art for my current collection, I have done past covers myself by taking photos or using Amazon’s cover templates. You can always do the work yourself and not spend a dime. I’m halfway to ninety-one years old and I’ve been writing and submitting for twenty-three years. As I get older, I’m less afraid to try new things, because I’ve seen all the old things that don’t work for me. I hate to be the guy who says, “In this day and age . . . ,” but honestly, we’ve been given all the tools to steer our destinies in whatever direction we want. One less obstacle between you and your reader will only make things better for both of you. I do feel like a lot of the stigma with self-publishing has gone away and that’s fantastic. People definitely seem to forget that because you self-publish, that means you have to self-market and that’s a whole ‘nother ballgame. I better get started on mine. Thanks! You’re welcome, James. Thank you and good luck! I liked this guest post so much and i think sometimes it need for us to get more refreshment. So i think this is the more better idea you take those help us to get more entertainment in here.